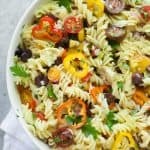 This Vegan Antipasto Pasta Salad is so full of complex flavors and textures, you won’t even miss the meat or cheese! Prep it in advance for easy packed lunches. You guys know by now that I’m a big proponent of meal prep—where you carve out a few hours on the weekend to prepare healthy meals for the rest of the week. 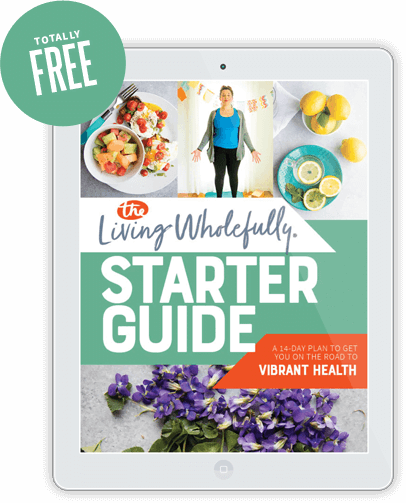 I think it is one of the most important habits to get into when you first start on the journey to eating a healthier diet. 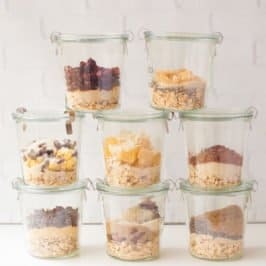 Sometimes I think meal prepping gets a bad wrap because of the Instagram pictures of neatly organized, perfectly-portioned, and undoubtedly, extremely-time consuming meal preps done by girls who do yoga on the beach wearing $1,000 leggings (#blessed). I’m here to tell you: that is not what meal prepping looks like in my house. Not by a long shot. For me, I usually try to carve out an hour for meal prep on Sunday while wearing my paint-stained, bright pink Crocs with a toddler running around yelling “POOP!” at the top of her lungs (#blessed). I set a goal to just make one food item for breakfast, one for lunch, and one snack. Does that cover everything we eat in a week? No way. But just having that little bit on the fridge goes a LONG way to helping make food preparation throughout the week much easier. It’s a buffer. A margin. 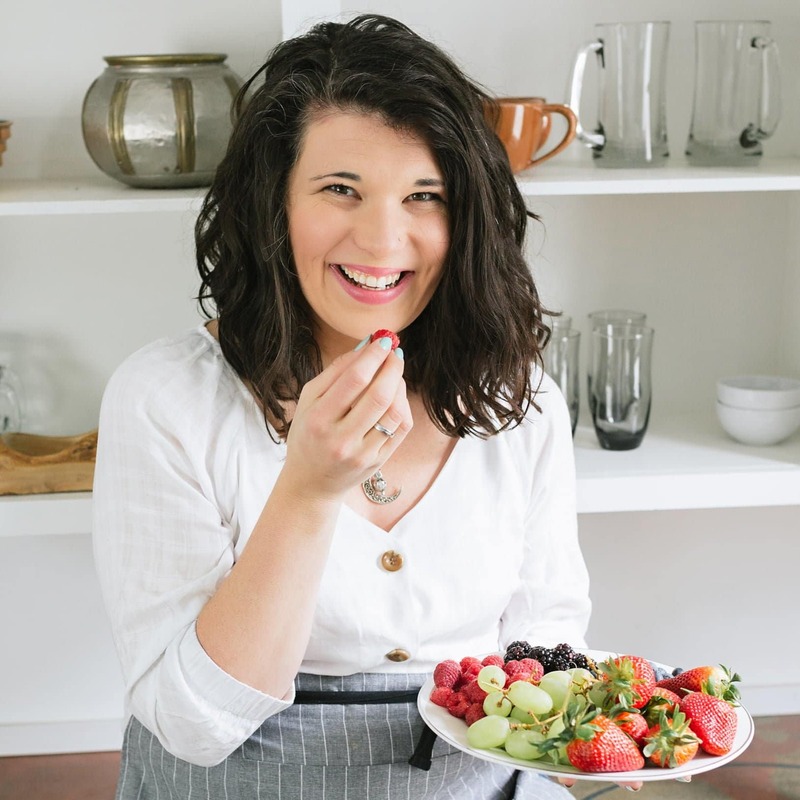 It’s enough preparation to make sure that on the days when you’re exhausted and overwhelmed and too tired to even think of making lunch, you have a healthy option. It’s enough meal prep to take the edge off without meal prep totally invading your life. If I’m being totally honest, I usually follow the same formula for my preps each week, too. 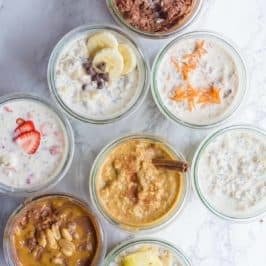 Something oat-tastaical for breakfast (overnight oats when it’s warm out or oatmeal cups when it’s chilly). Something protein packed for snack (like hard-boiled eggs or date bites). And then lunch is almost always one of two things (or both if, by some miracle, the toddler lets me cook longer): a salad in a jar and some sort of grain or pasta salad. I love doing grain and pasta salads for lunch meal-prep because the flavors get better and better as the salad rests in the fridge through the week. There is no heating required. And they always make a TON—which is perfect when you’re divvying the salad up into multiple servings over multiple days for multiple people. And since the salads are loaded with whole grains and veggies and beans and nuts and seeds, you pretty much have all your nutrition in one delicious package. I usually just scoop some of the grain or pasta salad into a container, grab an apple, and call it lunch! It doesn’t get much easier than that. There are a lot of awesome grain and pasta salads you can use for meal prep (Greek Quinoa Salad is a fave! ), but right now, I’m OB-SESSED with this Vegan Antipasto Pasta Salad. I know what you’re thinking. By definition wouldn’t an antipasto dish be decidedly un-vegan with all it’s meats and cheeses? 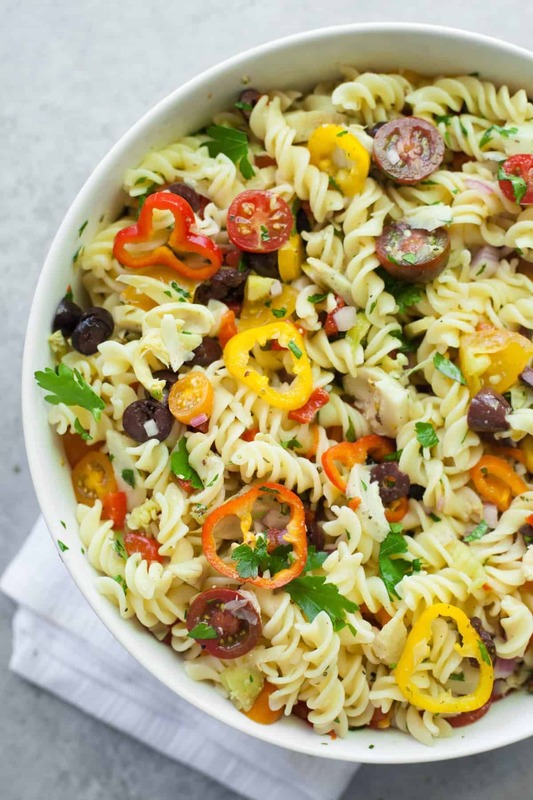 But let me tell you, even if you’re a meat-eater, you won’t miss the meat or cheese in this vegan antipasto pasta salad. It’s packed full of so many complex flavors, textures, and colors. 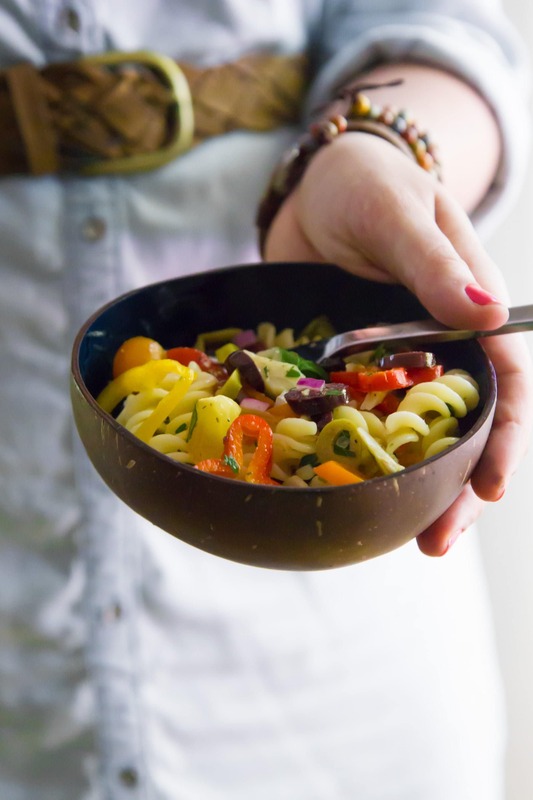 As a base of this pasta salad, I’ve been seriously digging Nuts.com’s gluten-free Italian Fusilli. It’s so good that I can’t even tell the difference between it and “regular” pasta. A few months back, we did a gluten elimination diet because my husband thought he might have gluten intolerence issues (and I went along for solidarity sake), and during that time, we tried out almost every gluten-free pasta on the market, and let me tell you, Nuts.com’s was, without a doubt, our favorite. So much so, we still eat it even though we’re back on the gluten train! So many gluten-free pastas out there have either (a) weird texture issues or (b) weird taste issues or (c) lots of weird gums and powders and other additives to make them more “wheat-like.” But Nuts.com’s gluten-free pastas cook up perfectly tender without falling apart and have that great carb-tastic wheat pasta flavor and texture—without any wheat. And the fusilli I used only has two ingredients: rice flour and corn flour. Hey, I recognize both of those! Of course, if you aren’t gluten-free, you can also check out Nuts.com’s line of wheat pastas. They have some seriously fun artisanal pastas for sale (how fun are these rainbow bowties?). As a Nuts.com Ambassador, I can’t recommend them enough. 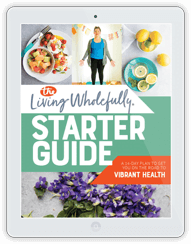 They are one of the most affordable places out there to buy healthy cooking staples like whole grain pastas, nuts, seeds, and dried fruit—and you get awesome bulk discounts, free shipping everyday, and the quality is absolutely top notch. I was a Nuts.com customer before they started working with me, and I’ll be one for life! 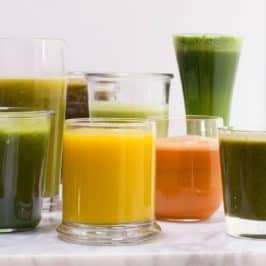 It’s such a great resource for those of us who live far away from a health food store and don’t quite have the access to healthy staples like you would in a city. Before I hand over the recipe for this pasta salad, one quick tip. 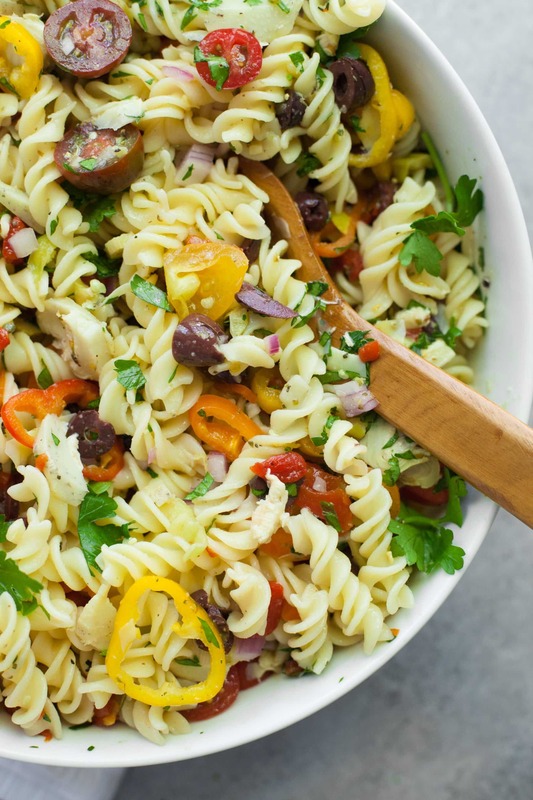 Red onions are delicious and spicy and add a ton of flavor to pasta salads like this, but sometimes, they can be just a bit too strongly flavored when raw. This is so easy to solve! When you drain your pasta, sprinkle the chopped red onions over the hot pasta, and let them sit for a few minutes. The heat from the pasta helps mild the onions just enough to take out any “bite” without softening them like sautéing would. Then, proceed with the recipe. Boom! Problem solved. Enjoy. Bring a large pot of salted water to a boil, add the pasta, and cook until tender, about 10 minutes. Drain in a colander. 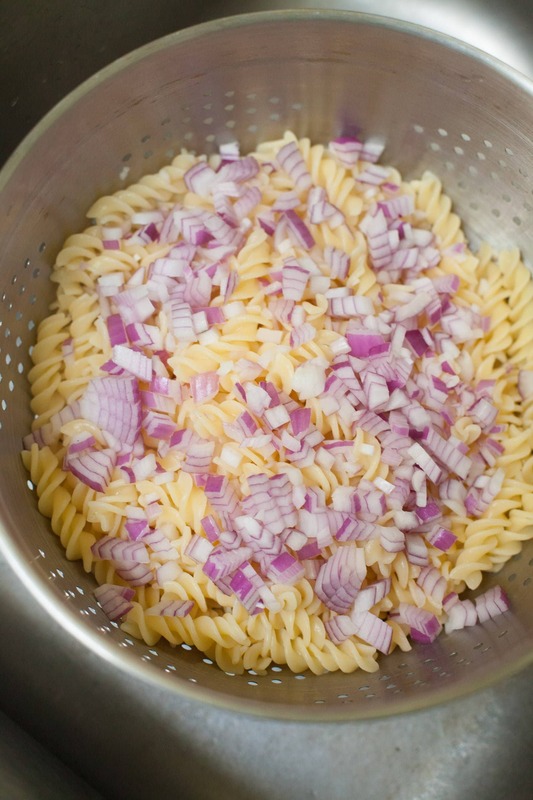 Sprinkle the red onions on top of the hot pasta, and let sit for 3-5 minutes to help mild the onion flavor. 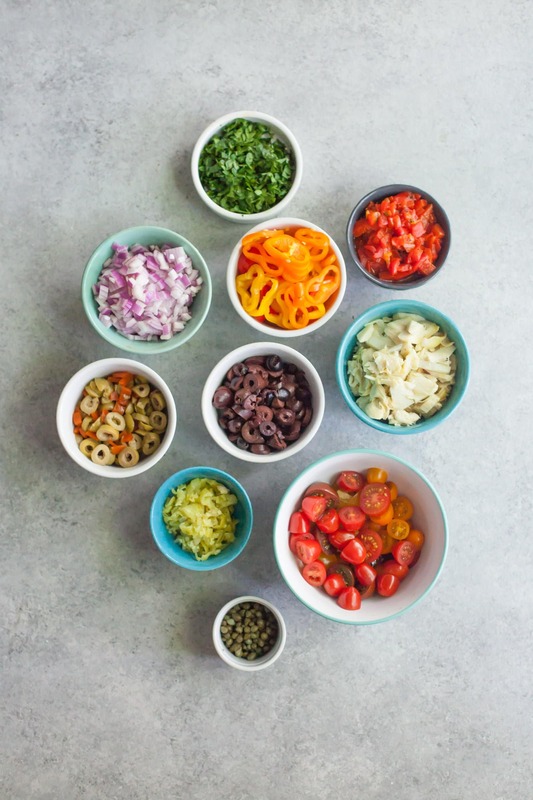 Combine the pasta and onions in a very large bowl with the artichoke hearts, pepperoncinis, bell pepper, olives, roasted red pepper, cherry tomatoes, capers, and parsley. Toss to combine. In a jar with a tight-fitting lid, combine all the dressing ingredients. Shake until well-combined. Pour dressing over pasta salad, and toss to coat. Serve immediately or let rest in the fridge for about an hour to cool completely and meld. Gluten-free pasta tends not to soak up as much dressing as normal wheat pastas. 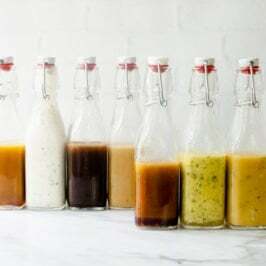 If you use white or whole wheat pasta, try doubling the dressing recipe, and then dressing the salad until it is pretty liquidy—the pasta will soak up the dressing in the fridge. A lot of the savory, salty flavor of this dish comes from the olives and capers. If you aren’t an olive fan, try leaving them out, but you might want to add more salt to the dressing. This is a sponsored post written by me on behalf of Nuts.com. All opinions are entirely my own. 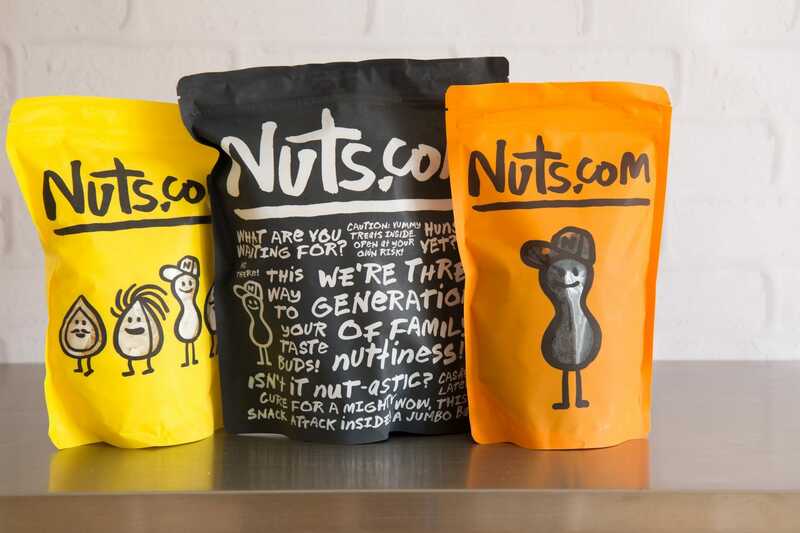 Learn more about Nuts.com by visiting their website or following them on Twitter, Facebook, Pinterest, or Instagram. 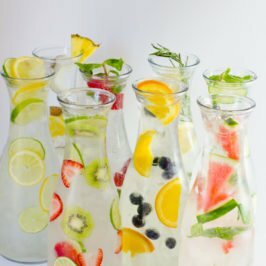 I can’t get over how colorful this recipes it! The perfect way to sneak in veggies for the next bbq. Also, I love your recipe cards, they’re so easy to print and organize! Google “Lovage” It is and edible salad leaf that not many people are familiar with nowadays. It is great in this type salad. 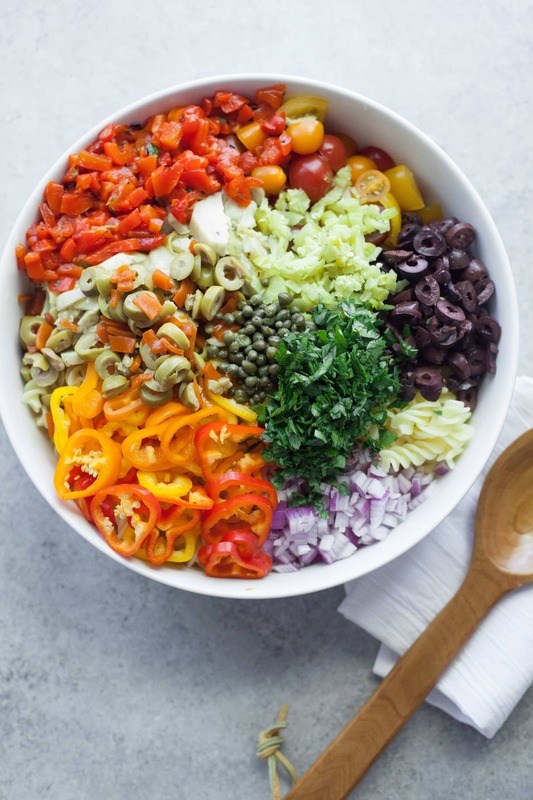 This salad looks fabulous!! I will certainly be making it. I have a question though…..what are whole pepperoncinis?? Also, where can I find it? I’ve never seen that ingredient before. Thank you! They are super mild pickled peppers that add a bit of tang and a tiny bit of spice to the salad (SO good). You can find them in most grocery stores in either the pickle aisle or the Italian food section. Man, this looks good. I’ve been off pasta for a year now, but I still like looking at recipes like a creepy stalker. Thanks for this great recipe! I made this for Father’s day and everyone loved it, very tasty. I used regular pasta, I doubled the dressing as suggested and it worked perfectly. A 5 star if I understand you. I will also say. a great big loud resounding——YESSS.